Bob and Mark are ready to pull this Twin Cam motor and head to the bench. There are many steps and a great deal of labor to get to this point. Here’s a broad overview of areas addressed (broken down, or removed) in order to remove the Twin Cam engine from the Softail frame. Drain fuel tank. Remove fuel tank & dash. Remove floorboards and mounting brackets. Remove oil tank and oil lines. Disassemble and remove entire drive assembly. Remove seat post with coil. 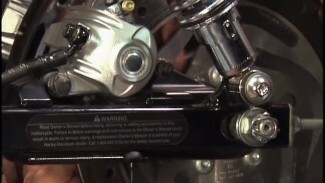 Disconnect shift linkage and transmission links – remove transmission. Unplug/disconnect harness at intake (map sensor). Also, crank position sensor, regulator. 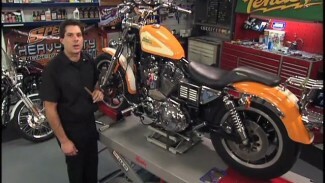 The Twin Cam engine must be removed from the right side of the frame. 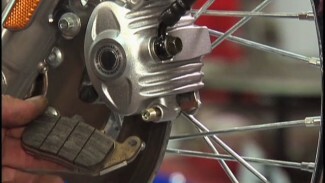 When removing the front motor mounting hardware, take note of the locations of the spacers. Always take a few extra minutes to spread painters tape on any areas that may be at risk of damage upon removal; especially the rocker boxes and frame. The Twin Cam engine is heavy. You need a plan before you begin lifting. If you do not have access to a hoist, chain fall, or winch, you will, absolutely need a second set of hands to help guide, lift and carry this motor to the bench. 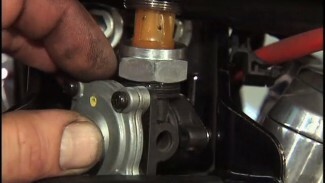 It is also important to be able to set the motor in an engine stand. This does not have to be something that you spend a lot of money on. You can make a simple, inexpensive engine stand. It is completely acceptable to make a stand out of wood. If it cradles the engine securely, it is a good engine stand. Whether you are doing a frame swap, motor swap, or a complete motor rebuild, pulling your motor is labor intensive and takes a considerable amount of planning. Practice and patience. Take notes, take photos, make lists, pick up a service manual.